This is a Sticky Post for the Bible Study Giveaway. It will stay here until Thursday night 8/30/07 about midnight. Scroll past this for my current post. I know! I know! I promised you a surprise on Thursday! Well, Thursday went by in a blur at my house--More about that in a little bit. I promised a surprise and I plan to deliver. Here we go! 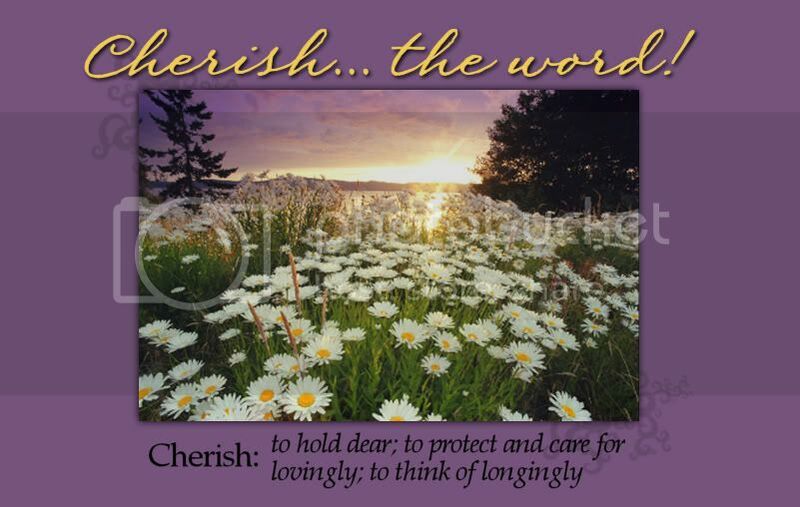 Fall Bible Study at Cherish...the word! "Discover the parallels of the Tabernacle’s building and your life as a chosen vessel of God. While the title is familiar, the content for this in-depth video teaching series is all new and rich in detail. 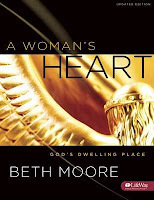 Taken primarily from the Book of Exodus, A Woman’s Heart: God’s Dwelling Place by Beth Moore will take you on a fascinating journey into why God would chose to live in a wilderness tabernacle, made by human hands. Taped in Beth’s home church in Houston, this updated edition of A Woman’s Heart contains all new video footage and exciting new graphics. Regardless of whether you studied Beth Moore’s first LifeWay study years ago, you’ll find A Woman’s Heart well worth another visit." This giveaway is very simple. Just leave me a comment on this post and let me know you would like to be included in the drawing. Be sure you leave a valid email address so I can get in touch with you concerning your real address. If you do not know about Fall Bible Study at Cherish...the word! you can read my Wednesday post to get all the info. I hope you will consider joining us for this study. I think it will be great to learn together! I am going to Texas to visit my brother. He has been diagnosed with a recurrence of cancer and is in the process of beginning radiation and chemo. My sister--who also lives in Texas but not in the same city--and I decided to go visit him this weekend. Our stepsister, who lives near my brother, will also be with us. We are going to love on him and give him our support as he begins this battle. He had surgery last year for this cancer. At his spring check-up there was no sign of cancer. Last week his doctors found that it had returned. I wrote about my brother and his wife when they celebrated their fiftieth wedding anniversary in July. He is my only brother and is very special in my life. I am praying that God will use these doctors to provide a miracle. I love him and his whole precious family so very much. This is going to be a quick trip. Some of you have read about my husband's illness. It is not easy for me to decide to be gone for several days. However, our sons will be with Lee while I am gone. He will be well cared for. I think they're planning a MAN Weekend! That's means non-stop sports--talk, TV, fantasy team strategizing, reminiscing about their own "glory days", etc! They probably won't even notice I'm gone! You're not likely to see a post from me this weekend. I may be around reading and commenting a little bit. I'll be back early next week. Please keep my whole family in your prayers this weekend. My plane leaves in 8 hours. I need to get some sleep! Myrna, I am off to take my walk with Jesus this morning and will remember you and your family. I think they will miss you ... the food will not keep coming from the kitchen. And ... the giveaway clenches it for me. If, as you say, I can download the videos on my computer for free, I want to take the study. So count me in on the giveaway! Becky, I'm sorry. I didn't mean to mislead--The downloads are not free--That's the only problem with this study! I have struggled with that. There is just no way around it.I guess if we could download for free no one would buy the product. Lifeway, unfortunately, is in the business of selling. I think the audios are cheaper, but it all costs. Of course, you can do the study in the book without the videos. You lose some of it that way--but I know people who have done that because they were studying on their own. ARGGH! Sorry your brother's cancer has recurred. Y'all be careful travelling and have a good time visiting. I'll be praying for traveling grace and for God's healing for him. Hope you have a good visit with your brother....will be praying for him and also for you. I'm so glad all you sisters are going. What a blessing and encouragement it will be for him. I'm like you, I bet Lee and the boys will have a good time!!! I pray God's blessings as you travel and that this will be a really precious time with family. I'll be praying for you and your family Myrna. Hava a safe trip and a blessed time with your brother. God is able - and He is good. Take care dear friend. You are in my prayers!! Thank you so much for stopping by and praying, in the midst of all your busyness. I'm so far behind! Have a blessed time with your brother and sister. There's nothing like siblings! I currently have a group of girlfriends that get together at my house once a week for Bible study. We started in May 2006 and have been going strong ever since. We're currently doing the Beth Moore book "Breaking Free". I love her stuff. I will plan on jumping in on your study once our group is done with "Breaking Free". I don't want to study two Beth Moore books at once, I tend to get confused easily LOL and am likely to start the discussion off here with something I would possibly read out of the book you're doing. Oh, and please enter me in the drawing!! Thanks for being so generous! I did not know, until I read it here on your blog today that Beth Moore had a blog. How exciting!! I am signing up for the giveaway. Also, God's strength to you as you minister to your brother and husband. It sounds like you have your hands full. I pray that your filled up as you pour out! I'd love to sign up. Thanks! I'll have to do it own my own though as there's no group here ... I am trying to start one though ... maybe it will be up in time for this ... otherwise I'll do alone. I'll be praying for you as you spend this precious time with your brother. I would love to participate in the giveaway! I'm am praying for you! I've never done a Beth Moore study, but have heard they are excellent. I would love this book! Please include me in the drawing. I'll be participating in a women's Bible study that's doing A Woman's Heart this fall and would enjoy discussing it online as well. I would love to win the book and participate in the study! Please enter me ion the drawing for the workbook- it would be such a blessing to win! I will be praying for your family and your trip. I would love to sign up for the giveaway! I'm about to start this study with my local group on the day after Labor Day. I'd love to discuss it online too, though. Praying for a safe and pleasant trip in spite of the circumstances. Sign me up! I would love to join you girls. I would like to be entered for the drawing! Thanks! I absolutely love Beth Moore and Bible Studies. Count me in for your special study and the drawing! I just finished my first Beth Moore study and thoroughly enjoyed it. I'd love to do more. Thanks for the giveaway. God's best to your family during this difficult time, as well. I would love to be included in your giveaway. Please enter me! I will be saying prayers for your brother. Video or no video, I'm sure this study will be great! Oh, thank you for the giveaway of such a blessed thing! Anyone doing a study like hers is going to be blessed off her socks. Count me in! And I'm sorry to hear about your brother and family trials. May you find yourself in abundant comfort. I'd love to participate in the giveaway. Your brother is in my prayers! I just found your blog but this bible study looks very interesting. I would like to participate so please count me in this giveaway. I am praying for your brother, I am so sorry to hear that. And ... the giveaway clenches it for me. I am interested in the study. Beth Moore does such wonderful studies and I would love to be entered into the drawing. I pray that the doctor's will be able to heal your brother of cancer. How fun! I'd love to be a part of the study! I want to be entered in your giveaway. I do not have the time to host a group in my home, but would love to participate in the study. Thanks for hosting it on the web, so we can discuss it on our blogs. Prayers for you and your family. I am believing in a Healing God to do miracles for you! I would love to win a Beth Moore workbook! Thank you. YES! I would love a copy! Praying for you and your family! And lease count me in the giveaway- I really want to try and get in on this, but have to do it with the book only. Please enter me in the drawing...and thank you so much for doing this! I wish for you and peaceful and joyous visit with your brother, despite the circumstances. What a wonderful idea to host a bible study online! I'd love to particpate in the giveaway. So sorry to read about your brother...you and your family are in my prayers. I am interested in the bible study also. Please count me in on the giveaway. I would love to do this study! Please enter me. Thanks! oh count me in... and for the free giveaway too!! thank you for doing this!! Fun!! Will be lifting up your family as He leads!! I LOVE Beth Moore and really, really, really HOPE to win one of these workbooks because I sooo want to do this study with you all!! I'll be praying for your family!! Enter me into your giveaway Please! I would love to enter the contest and can't wait until the series starts! This is my 1st time to visit your blog and I come via BooMama's blog. I would like to sign up for the giveaway and I borrowed the study from our assoiciation and I am facilitating the study at our church but I would love to join you all for the Fall On-line Bible Study! May God give you peace and comfort and rest as you care for your family!! Have a blessed week. Also, would love to be included in the book draw. Always wanted to do one of Beth Moore's studies. I would love to have a Bible Study that I can start doing this fall. I think I need something to sink my teeth into as I make the transitions necessary to live in peaceful harmony with my kids. I would like to be entered in the drawing for the workbook! Thank you and have a blessed week! Please enter me in your drawing. Thanks and God bless. What a wonderful study. I'd like to be entered to win. Count me in on the Bible study. I am still behind catching up with everyone since I got rid of Jury Duty. Great thing that you are doing via Bloggityville!! Oh, my. I would loooovve to do a Beth Moore study again. Please please enter my name in the drawing! Oh yes, please do enter me. This sounds fantastic! I love Beth Moore. Enter me in the giveaway. I NEED A LITTLE HELP, FRIENDS!